Can I use Novocall on multiple domains? 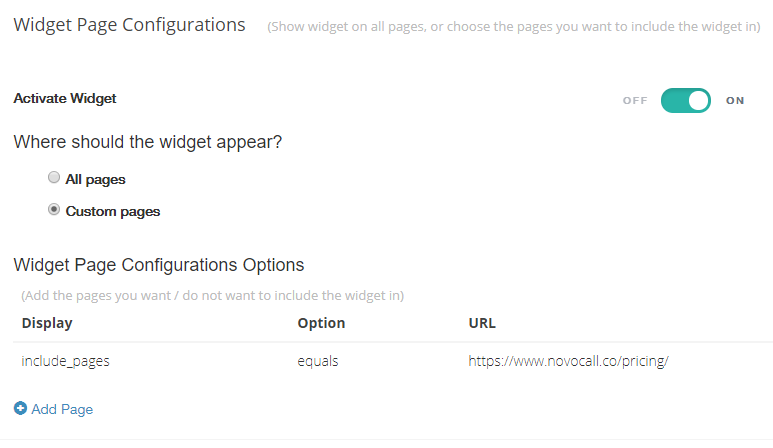 Yes, you can use different Novocall widgets on various domains and websites. Yes, you'll be able to create multiple widgets on different pages and different domains. There'll be times when you'll require different widget settings on different pages. A common example of this is when you want different texts or designs appearing on the popups for different pages. With multiple widgets, you can build separate widgets for different departments. Let's say you have 2 departments with different call reps for Product A and Product B. You can make 2 widgets and assign the respective call reps for the pages and products. Upon clicking "Widget" button, you'll be shown your current widgets, as well as an option to create a "New Widget"
exclude the pages that your main widget is currently displays in. Under "Settings" > "Widget Settings" > "General Settings"
This widget should look different from your main widget. Customize away! Learn further ways to customize your widget, such as custom working hours for call reps and different widget triggers.